The Bar Council is organizing a march on 26th September 2007 at 11 a.m. at the Palace of Justice in Putrajaya in connection with the allegations arising from the above video. The march will be made to the Prime Minister’s Office where a memorandum will be given to the Cabinet to call for the setting up of a Royal Commission to investigate the recent video purportedly involving the fixing of appointment of judges. Transport will be provided to fetch members from the Malacca Bar Committtee’s office to Putrajaya. Members of the Malacca Bar who are interested to participate in the march are to contact Mr Lawrence Ang of the Bar Committee and register accordingly. The group shall leave at 9 a.m. from the Malacca Bar Committee’s office. Poll: What Do You Think of This Website? Your views have been noted and changes are in store for this website. In the interim, a new poll has been put up. So, please feel free to cast your votes. The Malacca Bar Committee regrets to inform members that the mother of Fiona Tan had departed from this life yesterday. The Committee joins Fiona and family, including Jaspal Singh Gill, in this time of sorrow and grief. The wake is being held at No. 7474B, Taman Mayfair, Klebang Besar. The funeral will be held on Tuesday at 11 a.m. at Bukit Sebukor. The Malacca Bar Committee also wishes to announce with regret that the father of Vanitha Rangganathan has passed on this morning. The wake is being held in Taman Sentosa, Bukit Baru ( opposite the Bukit Baru police flat ). The Committee extends its deepest condolences to Vanitha and family. The reality of death, being a certainty of life, is a reminder to all of us to number our days that we may gain a heart of wisdom and live for the right priorities in life. One of the principal concerns raised was the issue of delay in general, whether arising generally or specifically – from investigations, charges being made out against accused or in the supply of police reports. While investigations and/or charge can take some time, members are advised that at least in relation to the supply of police reports there is a benchmark of 3 days for police reports to be supplied. 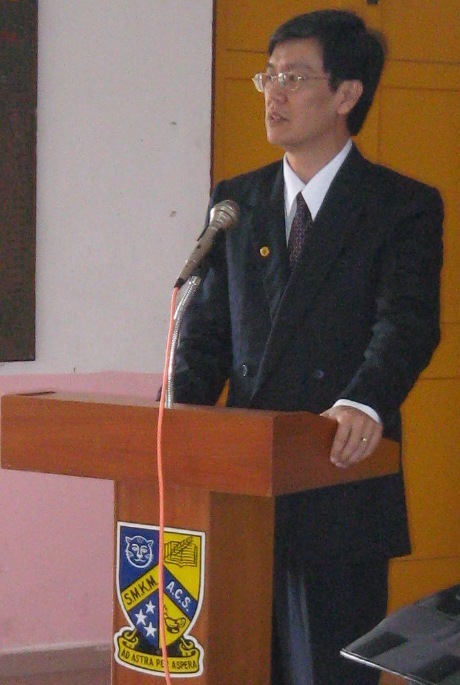 On 3.09.2007, the Chairman of the Malacca Bar, Mr. Ng Kong Peng launched the Legal Aid Awareness Campaign (themed Next Generation Rights), at the Malacca level, at the Anglo-Chinese School in Tranquerah, Malacca. In his speech to commemorate the event, the Chairman highlighted that 2007 was a signal year for the nation. After all, it had just celebrated its golden jubilee. Nevertheless, the Chairman gently reminded everyone that the milestone was not purely reserved for walks down memory lane. The milestone also serves as an opportune time to remind ourselves that the hope of this nation’s future lies in the hands of its youths. More so, when it is considered within the backdrop of a recent census which confirms that 1/3rd of the nation’s population were below the age of 15 years old. For that reason, it was important to realize the rights of our next generation in a more significant manner as it would further cement the democratic ideals and aspirations of our forefathers. Following this launching, the Malacca Legal Aid Sub-Committee hit the proverbial “campaign trail” and gave talks at a number of schools. Thus far, talks have been given at the following schools i.e. the Anglo-Chinese School (3/9), the Methodist Girls High School (5/9) and Sekolah Menengah Kebangsaan Sultan Muhammad (4/9) with topics ranging from individual rights against the police, traffic rules and sexual abuse. The events would reach its apex on the 8th. and 9th. of September whereby the Malacca Legal Aid Sub-Commitee will be holding a legal aid clinic from 9.30 am – 5.30 pm in Tesco Melaka. Members of the public are invited to turn up and avail themselves of the free advice provided on that day. MALACCA, Thurs: The Malacca Bar Committee, led by Ng Kong Peng, paid a courtesy call to the Malacca Police Chief, Datuk Mortadza Nadzerene. Some high ranking members of the Malacca police force were also present at the meeting. In his welcoming address, Datuk Mortadza said that lawyers are part of the criminal justice system and that the police and members of the Bar should work together to fight crime in Malacca. At the moment, Malacca ranks 6th in the country in terms of crime rate. On that note, Datuk Mortadza said that the police will support the Legal Aid Sub Committee’s programme in conducting talks in secondary schools on issues of crime prevention. He said that it is important to educate school children and encourage them to stay away from crime. During the brief meeting, Fatima Tahir Ali, the Chairperson of the Legal Aid Sub Committee, presented a plaque to Datuk Mortadza as a token of the Bar’s appreciation for the support and contribution by the police to school projects during the recent Legal Aid and Law Awareness campaign.